Sun Valley Resort begins its 76th year with visitors voting their satisfaction and even more improvements planned. Fireworks exploded, skaters leaped, and skiers paraded down the starlit mountainside carrying torches on December 21st in celebration of Sun Valley’s 75th season. Sun Valley’s diamond year celebration is also a celebration of skiing in North America: Sun Valley was the first destination ski resort and its history is a story of aiming higher with innovative thinking and improvements. Sun Valley continues to set standards for all resorts. 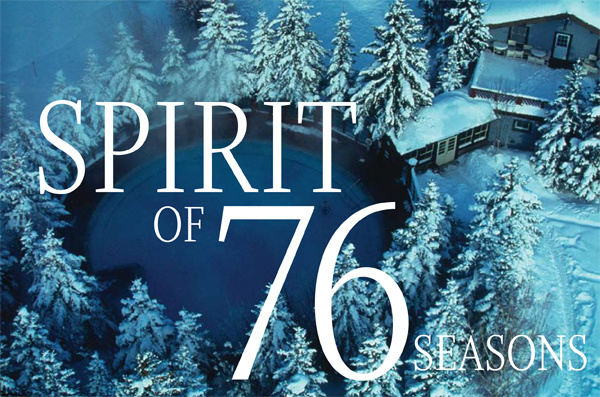 In the spirit of 76 seasons, Sun Valley aims to get even better. This year, visitors can enjoy improvements and enhancements both to Baldy and Dollar mountains. Six new adventure trails open on Baldy. These trails target adventuresome six–twelve years olds and anyone else with an intrepid spirit. A green or blue code designates the trails’ difficulty, and the wildlife- themed names alert visitors to animals indigenous to the area. “They are planned to be fun, and to be safe with carefully considered marked entrances and exits,” notes longtime Sun Valley executive, Jack Sibbach. In addition, Sibbach reports that 30 acres of new, additional glade skiing and boarding open this year on Baldy for those who want to the challenges of maneuvering through the trees. Long recognized as the top teaching mountain, Dollar Mountain’s recent improvements have built upon its reputation as a hub for family fun. To better promote Sun Valley as a family destination, in recent years, Sun Valley built the elegantly appointed Carol’s Dollar Mountain Lodge. In addition, it relocated the tubing hill near the lodge and built a terrain park on Dollar Mountain that is intended to challenge and thrill. Building on its success, this year, the Warm Springs 18-foot half pipe is now located on the top half of Old Bowl at Dollar, and in addition there are 20 new rails. Following on last year’s successful introduction of its signature feature, The Quad Wall, this winter Sun Valley unveils its Progression Park and is incorporating using the terrain park in the SnowSports School. The FreeRide program trains intermediate and advanced youngsters to progressively maneuver the park. Families have another exciting activity at Sun Valley: exploring the Skier and Boarder Cross Course on Dollar Mountain. “There’s a lot of new exciting family fun, and we are doing it the Sun Valley way—carefully thought out and well executed, and always mindful of safety,” Jack Sibbach explains. Annually skiers voice their favorites for SKI Magazine, and the 2011 results boosted Sun Valley up to the #5 overall favorite in the West. This ranking was propelled up by the top #1 ranking for luxury and lifts. There were soaring #2 rankings for service, character, grooming, and food, and high rankings for lodging, nightlife, off-hill activities, and (of course) scenery. “This ranking reflects the commitment by our employees and really the whole town to enhance our visitors’ experiences,” comments Jack Sibbach. “We are really pleased, but that doesn’t mean we can’t do better,” he adds with the famous Sun Valley go higher attitude. Number one in luxury, and yet a bargain. That’s the spirit.